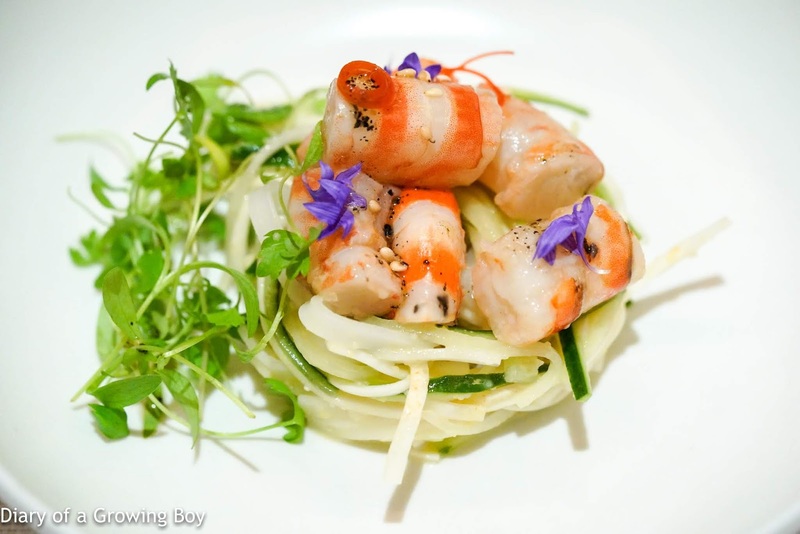 Tonight I had the privilege of being invited to the 4-hands dinner at Amber featuring cuisine from Mingles in Seoul. 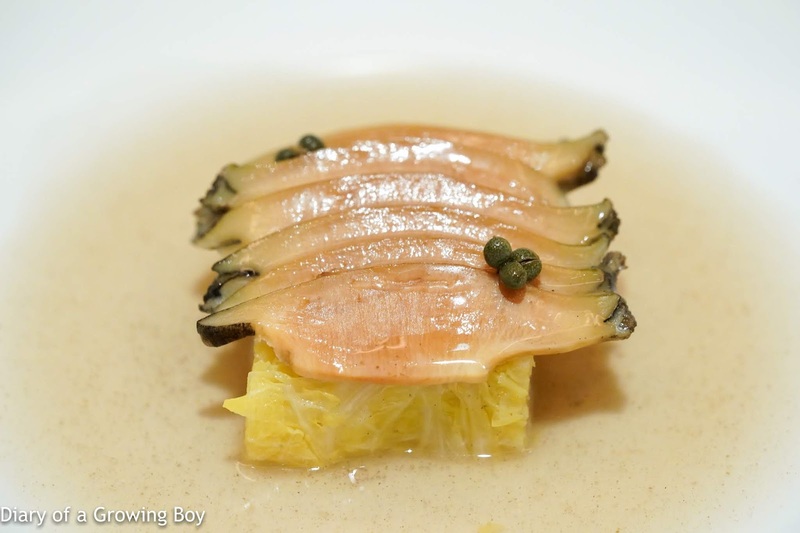 Having paid a visit to Mingles and coming away impressed last year, I was curious to see which dishes chef owner Mingoo Kang would bring to an audience here in Hong Kong. Those of us being invited as "media" were placed at a long table inside the restaurant's private room. While the typhoon yesterday had disrupted plans which meant I couldn't see a friend from Seoul, the silver lining was that I got seated next to The Great One. 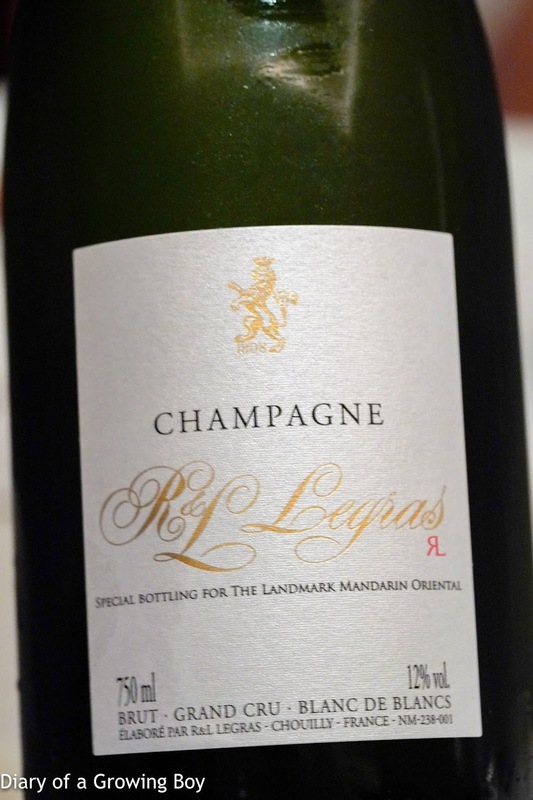 R et L Legras Blanc de Blancs - high acidity here, full-bodied with lots of depth. 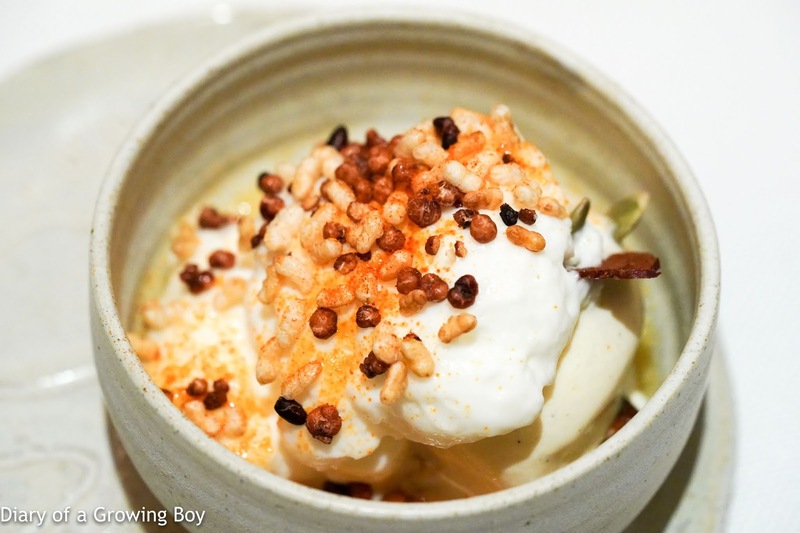 Warm egg custard with kimchi, namul, chorizo, by Mingles - with small bits of smoky chorizo, and crunchy strips of skinny string beans. 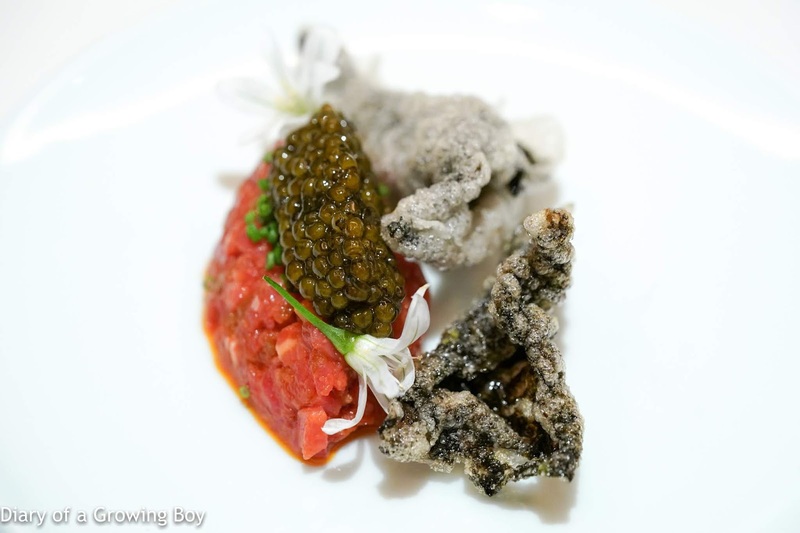 Korean style beef and caviar tartare, by Mingles - the first of only two plates I have had in Seoul last year. The beef tartare was seasoned with gochujang (고추장) and was definitely spicy, but also came with the fragrance of sesame oil, along with little crunchy bits of vegetables. It worked pretty well with the schrenki caviar as well as the seaweed crackers. 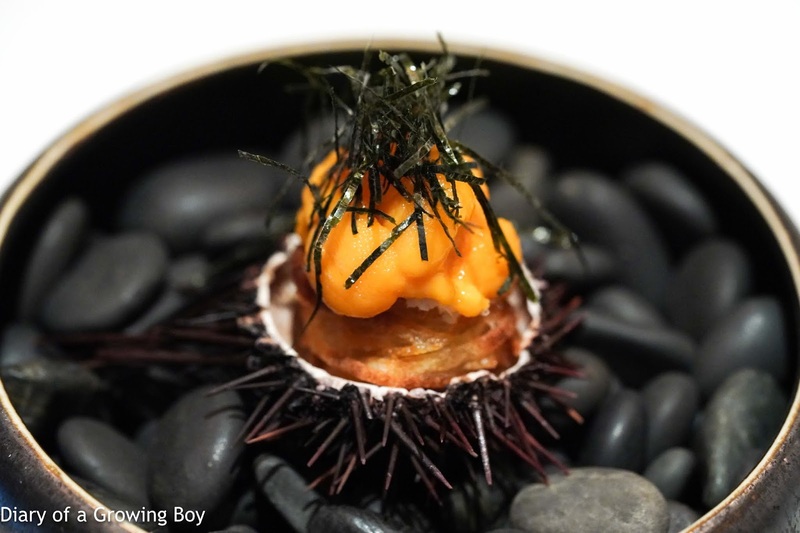 Our server told us that the schrenki caviar came from Russia, and I questioned him on this, as I remember being told before that it comes from sturgeons farmed in Heilongjiang (黑龍江) China. In fact both Kaviari and Petrossian - the suppliers for the restaurant - list the origin as China. The server then backtracked by saying that the sturgeon "comes from the area between Russia and China", implying he was justified to call it Russian caviar... I wanted to smack him. Aka uni and ikura over crispy potato with wakame and horseradish, by Amber - the combination of very creamy sea urchin and salmon roe sat on top of a crispy potato ball, and the strips of nori (海苔) worked very well with everything. Crispy kabocha, preserved black truffle and wet hazelnuts, by Amber - the black pita bread contained with some kabocha (南瓜) purée and black truffle purée, topped with a thin slice of Australian autumn truffle (I assume it was harvested during Australia's autumn, hence it was 'preserved') as well as a wafer of hazelnut. There was a tiny bit of paste which helped the two slices on top stick together, and whatever it was tasted very salty. Kuruma ebi with cold vegetable 'japchae', by Mingles - a few of us chuckled when our server introduced the dish and told us the tiger prawns were served with "some kind of mixed vegetables", slow-cooked with kohlrabi and sesame oil. The prawns were, of course, absolutely delicious and coated in fragrant oil. 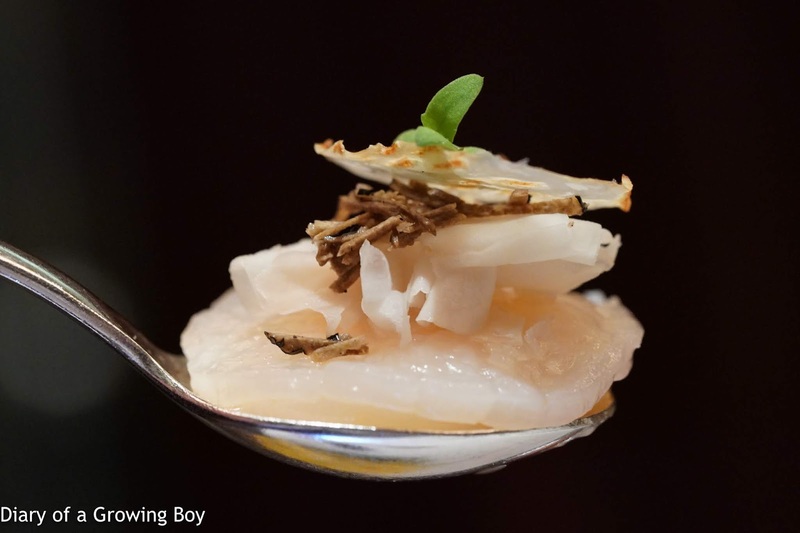 Below we would find julienned kohlrabi, celeriac, cucumber, as well as some chewy, flat rice noodles. 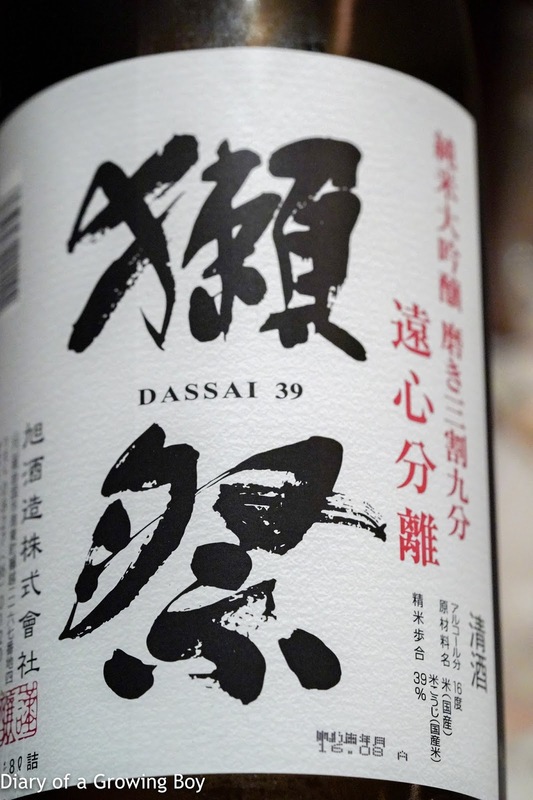 Dassai 39 Centrifuge (獺祭 磨き三割九分 遠心分離) - a junmai daiginjo (純米大吟醸) with seimaibuai (精米歩合) of 39%. This cuvée uses a centrifuge to separate the sake from its lees. Nose was very fragrant and tropical, with stone fruits like apricot. Sweet on the palate but turns dry in the middle before finishing with sweetness again. 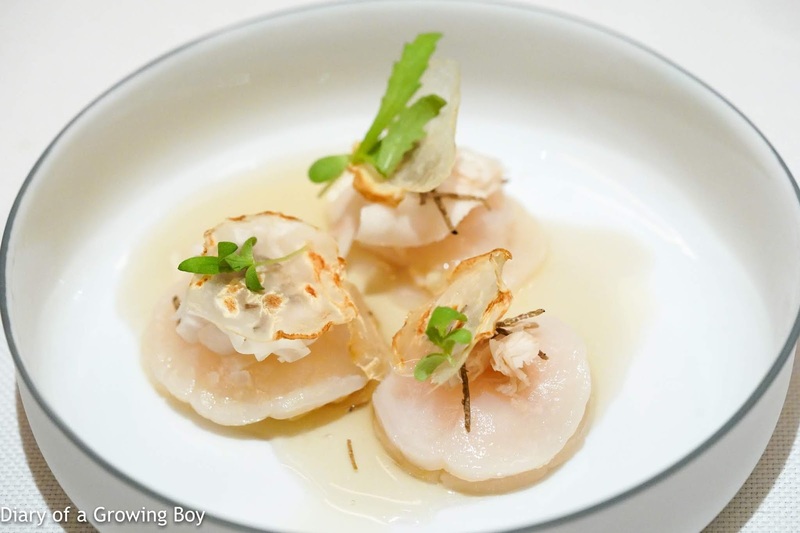 Hokkaido scallops served raw with shaved button mushrooms, cold clarified celeriac bouillon and extra virgin hazelnut oil, by Amber - wow... that description is quite a mouthful! So we have slices of raw scallops, topped with thin slices of celeriac, very thin strips of truffle, and shavings of button mushrooms. Needless to say the flavors from the truffle and mushrooms were pretty nice. Overall this was a pretty nice dish. 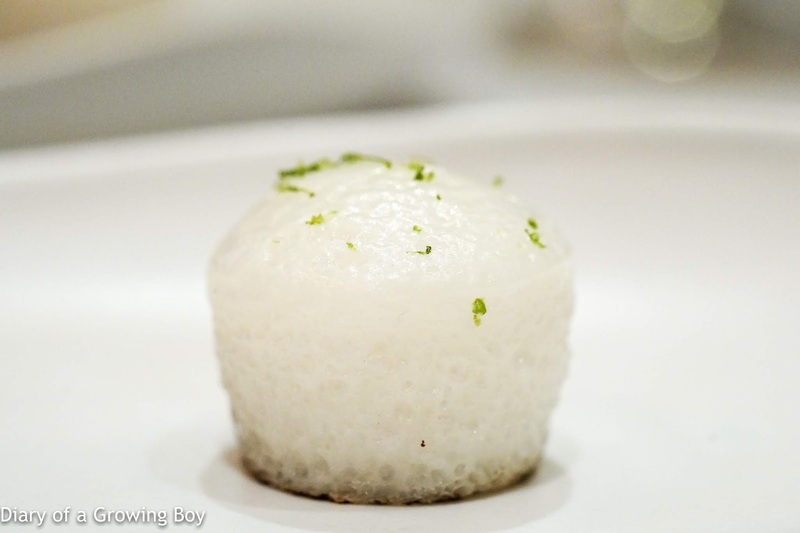 The abalone rice cake had a sticky and bouncy texture, almost like Chinese white sugar sponge cake (白糖糕). There was diced abalone and peppercorn stuffing inside, with a light sprinkle of citrus zest shavings on top. 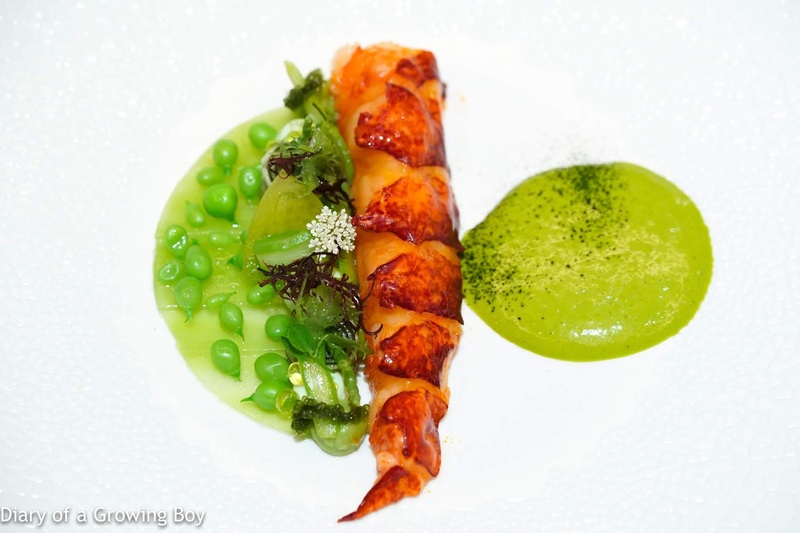 Blue lobster confit in kelp infused butter with green vegetables, seaweeds and aromatic green garden herbs, by Amber - the homard bleu from Brittany was, of course, absolutely delicious with a rich depth of flavors. The vegetable sabayon on the side had a good amount of acidity which helped balance out the richness of the lobster confit. The dish also came with some peas, zucchini, asparagus, green tomatoes, seaweed, and what appeared to be celtuce stem. 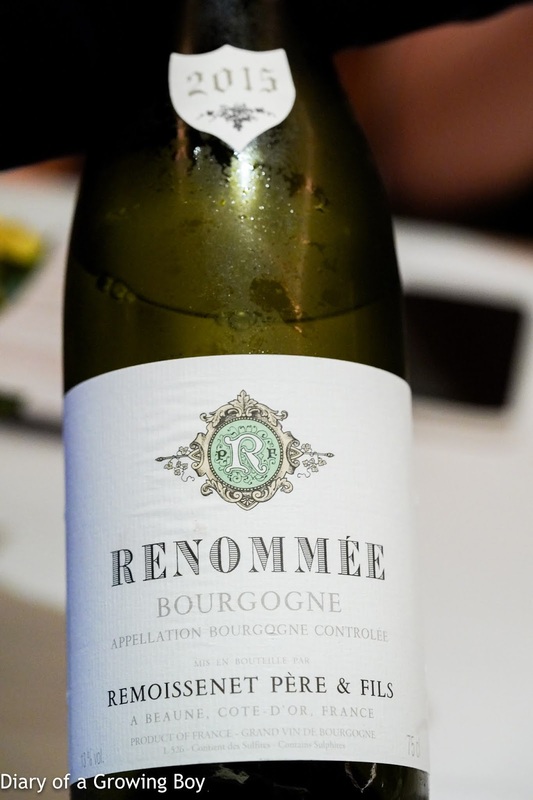 2015 Remoissenet Bourgogne Blanc Renommée - apparently a blend of Chablis and Puligny-Montrachet, this was pretty ripe and hot on the palate. Blackthroat seaperch stuffed with mixed vegetables, potato fritter, 'jang-a-jji' sauce, by Mingles - curious to see the blackthroat seaperch (喉黒) came with stuffing, which appeared to include leeks. I love this type of fish and the execution was very good. The jangajji (장아찌) sauce was tangy and spicy thanks to the pickled vegetables, and really perked up the dish. I was surprised to see the crispy potato at the bottom come in concentric circles... like peeling away rings of an onion. 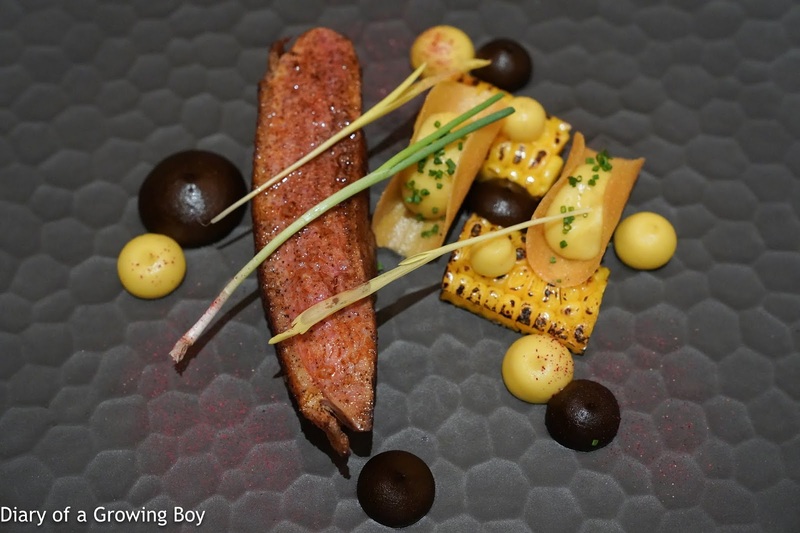 Dombes duck dry aged then roasted, rubbed with coffee and smoked paprika, Okinawa corn, hibiscus dust, corn sprouts and homemade mole, by Amber - the duck was a little more firm than I had expected, although I wouldn't call it overcooked. The mole was OK, but I'm a sucker for corn. 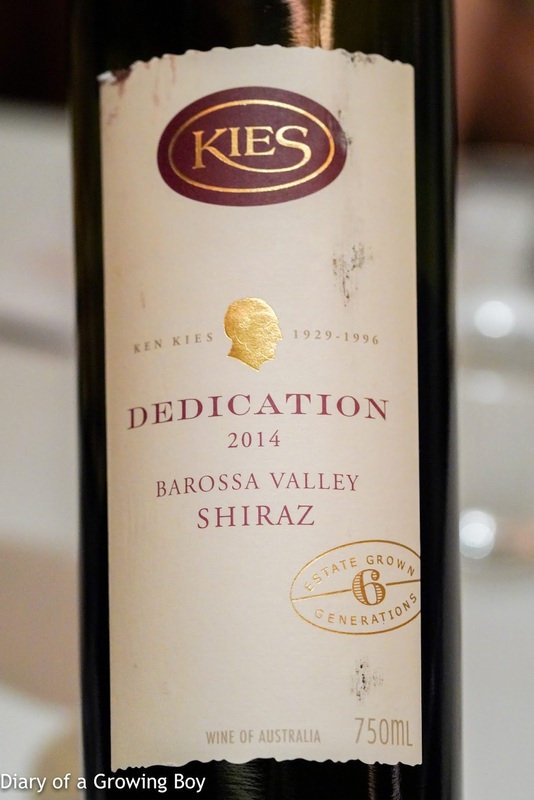 2014 Kies Family Dedication Shiraz - not just your typical Aussie shiraz, but the nose also showed some metallic iron I often find in Cali syrah. 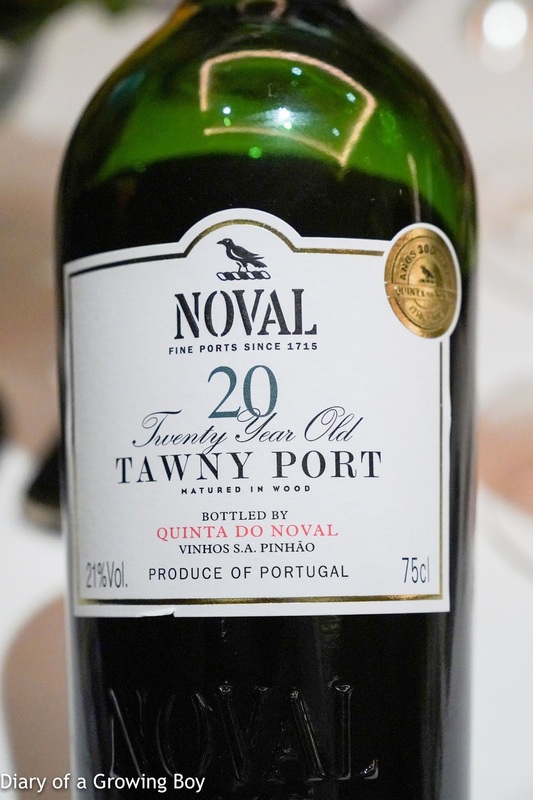 Quinta do Noval 20 Year Old Tawny Port - sharp and alcoholic on the nose, with raisins and a little nutty notes. Kacinkoa 85% chocolate and tofu ganache, foam, cacao sorbet, almond praline and cacao nibs layered between crispy cacao sheets, by Amber - apparently the kitchen started experimenting with using tofu instead of cream in their chocolate after a guest requested for milk-free chocolate, and Richard liked the result. 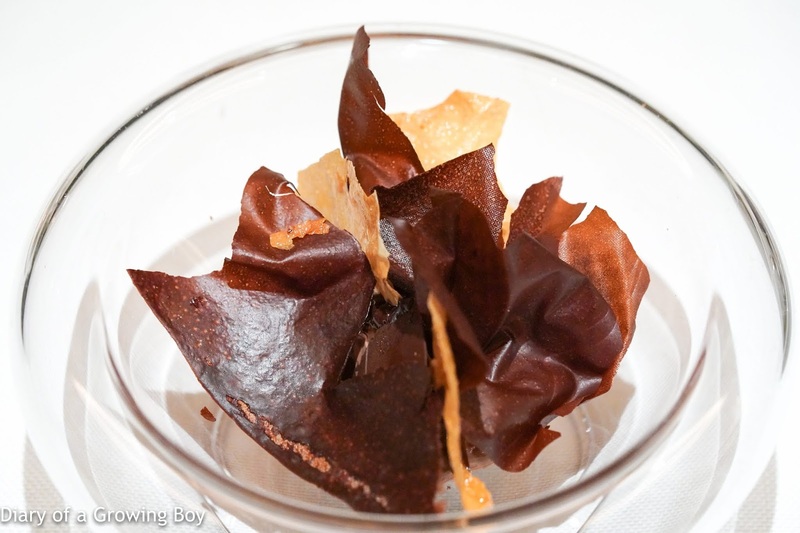 Served with cacao sorbet, pralines, and crispy cacao and yuba (湯葉) sheets. Lactose- and gluten-free. 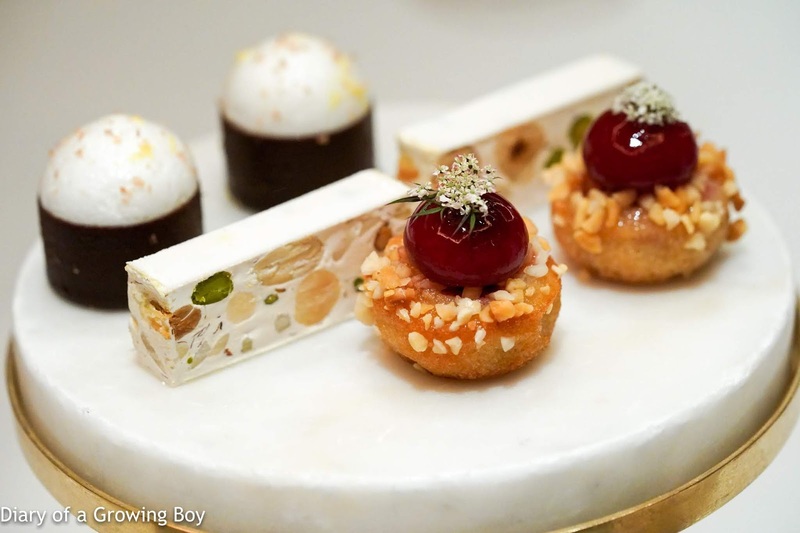 The petit fours came, and I was happy to see the chocolate caramel with ginger foam, nougat, and a little cake topped with berry gel. 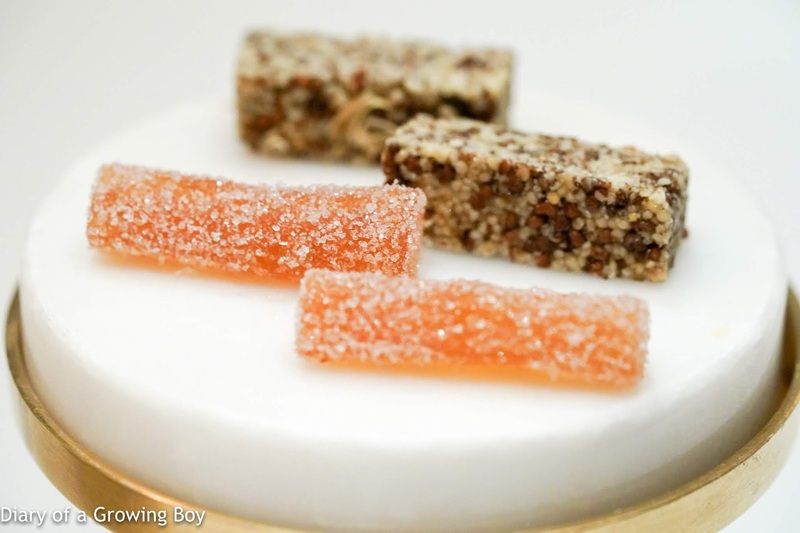 This set was definitely Korean, as the pâté de fruit tasted of bitter ginseng, while the other 'nougat' was made with shredded jujube and sesame. 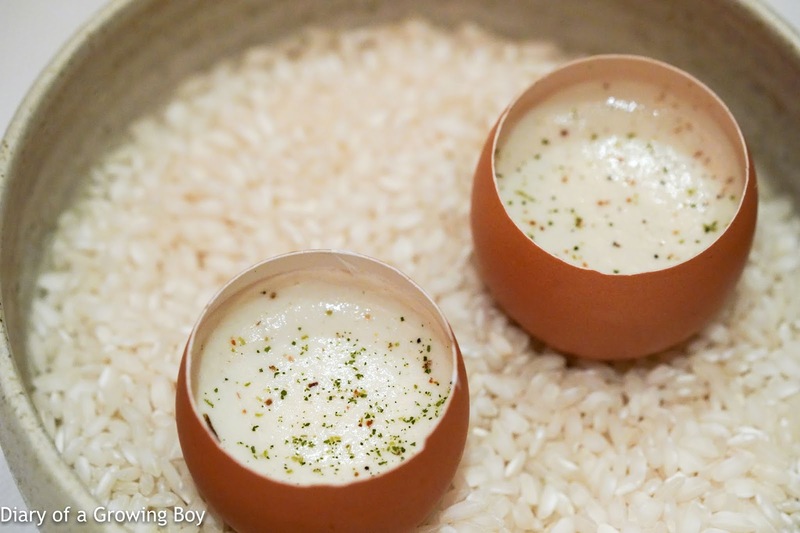 This was an excellent dinner, and far exceeded my expectations. 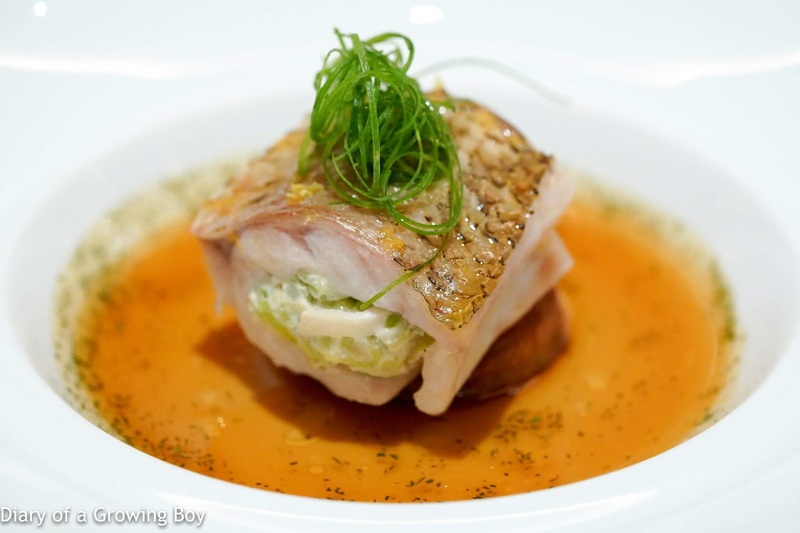 When I first heard about this collaboration a while ago, I was afraid that I would end up having dishes from Mingles that I had already tried before, coupled with the usual 'signature' dishes from Amber that I could have on any other day. Thing couldn't have turned out more differently.